The Woozle is hungry, and it’s your job to feed him all the nasty snacks that he loves to eat. Chocolate-covered flies and hairy pickles? Yum. Sounds like a good time to me. 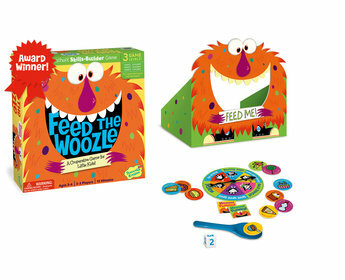 Feed the Woozle is a preschool game by Peaceable Kingdom. It’s a cute little dexterity game for kids 3-6, though my older son had a blast playing with his younger siblings. The object of the game is to walk a spoon full of 1-3 food tokens over to the Woozle, and put them in his mouth without dropping them along the way. Roll the die, put that many foods on the spoon, and off you go! Well, almost. Older kids have the challenge of spinning a spinner to see if they have to bunny hop, hula, spin, go crazy, or walk backwards while trying to feed the Woozle. Blindfold even older kids for an extra challenge. My kids got a kick out of reading off all the gross foods the Woozle likes to eat. They had even more fun trying to come up with more challenging ways to get to the Woozle. Bunnyhop and spin at the same time? Crabwalk? Carry the spoon in your mouth with your hands behind your back? It’s all fair game. Like all Peaceable Kingdom games, Feed the Woozle is cooperative. Get 12 foods in his mouth before you run out of them, and everyone wins. It makes it low stress, with the kids all rooting for each other to complete their task for their turn. Got young ones in the house? You can’t go wrong with this one. A copy of Feed the Woozle was provided free for review by Peaceable Kingdom.